Website design for government agencies requires much more experience and knowledge than most other website design projects. Our Toronto web design company has both the experience and skills to get the job done. Government website design is usually pretty awful. Many government website designs seem to be based off a standard template that reminiscent of the early 1990s. They’re often tired, old and unresponsive. Not too long ago Parachute Design landed an opportunity to break the cycle for the Environment and Land Tribunals of Ontario. In our first contact with the government agency, our Toronto web design company entertained the request to develop a government intern’s attempt at website design on using a free website builder. This type of web design project is not something we would undertake but took the opportunity to approach the conversation in a different light. Instead of politely declining the work, we put together a short presentation on the best practices for government agency web design and presented our website design approach and experience to the board. By the end of the hour-long meeting, everyone sitting around the boardroom table was converted and raring to throw out the old templated approach and explore a new custom website design for the government agency. 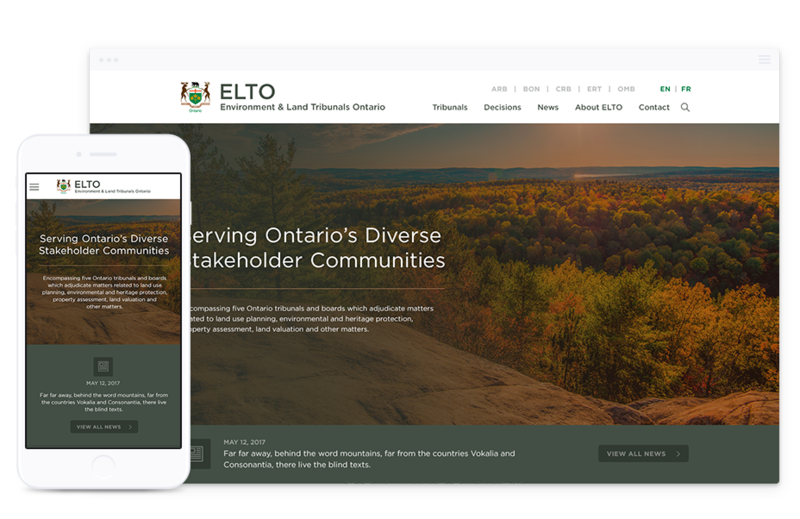 To explore one of our best web designs for government agencies, please take a few moments to have a look at our Government of Ontario (ELTO) case study. To further understand how we turned this project into a success and learned more about what makes a government agency website design successful continue reading. All government agency website design is required to be completely bilingual in Canada. To achieve a fluid and intuitive multi-language website our Toronto web design and web development team had to focus on both the front end design and backend development early on in the project. Our web design team focused on creating a friendly user interface design that was flexible enough to accommodate the longer French translations and a website navigation system that was able to adapt to the constant evolution of multi-tiered menus in both French and English. Our web development team took aim at the custom WordPress backend of the website and began laying the groundwork to ensure the page editor was bilingual and able to switch back and forth between languages to ensure website management was quick and easy. A well-executed website navigational system is essential for any website. However, more stringent rules and guidelines are in play for government agency websites. To ensure our website design exceeds expectations and requirements, we first review web analytics data from the existing website to understand how visitors are currently using the website. This strategy also offers the opportunity to identify weak points in the current website navigation or page architecture so that we can create design solutions in our site mapping and wireframing stages before tackling the new government agency website design. Government website design is not cutting edge, and it’s probably not flashy in any sense, but this doesn’t mean it can’t be beautiful in its right. The key to pushing through a government agency website design that is current and trend-setting for the industry is subtlety. Approaching the user interface design with a subtle colour palette and soft or unobtrusive design elements allows the web designer to break free from the tired and mundane layout other government agencies use. This approach comes across as less of a departure from the norm and is better received by the approval committee. Website design for government agencies also poses challenges with sourcing the perfect stock photography and ensuring there is an acceptable balance between all ages, ethnicities and cultures within Ontario and Canada alike. When creating a project plan for a government website design, we often include additional time allocated to sourcing imagery throughout the new user interface. Deploying a website that is truly representative and inclusive of all people governed within the region is essential to communicate with web users, earning trust and creating a relationship between the government agency and the audience. Responsive website design is an absolute must-have for government agencies. In addition to offering a flexible interface that can adapt to all contemporary screen sizes and devices, government agency websites are often used extensively in communities with low internet bandwidth or scientists working in remote areas of the country. Understanding the audience and the limitations of their region or technology must be a crucial part of early website design strategy. Perhaps the most championed best practice for government agency web design is website compliance. All websites and digital properties owned or managed by government agencies are under the microscope. All of the best practices we’ve discussed so far possess a role in the design of a government website that passes the most stringent accessibility compliance tests. Not only must the website be beautifully designed, inclusive of the entire demographic, and responsive, it must be accessible to anyone, anywhere, with any disability or impairment. To inquire about a more detailed web design methodology or to learn more about our best practices for government agency website design, please contact our web design experts in Toronto at 416-901-8633. To request a website design proposal for your government agency, please complete our online quote request form. Need a Quote for Your Government Agency Web Design? Undertaking web design for government agencies can be complex without the right experience. Our team of professional web designers can help you plan and execute your next web design project.